The activity patterns of the globus pallidus (GPe) and subthalamic nucleus (STN) are closely associated with motor function and dysfunction in the basal ganglia. In the pathological state caused by dopamine depletion, the STN–GPe network exhibits rhythmic synchronous activity accompanied by rebound bursts in the STN. Therefore, the mechanism of activity transition is a key to understand basal ganglia functions. As synchronization in GPe neurons could induce pathological STN rebound bursts, it is important to study how synchrony is generated in the GPe. 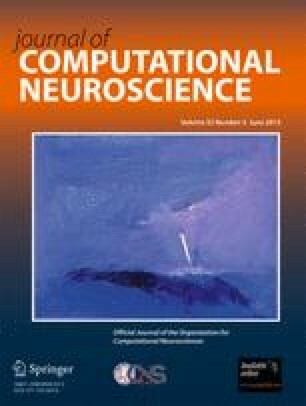 To clarify this issue, we applied the phase-reduction technique to a conductance-based GPe neuronal model in order to derive the phase response curve (PRC) and interaction function between coupled GPe neurons. Using the PRC and interaction function, we studied how the steady-state activity of the GPe network depends on intrinsic membrane properties, varying ionic conductances on the membrane. We noted that a change in persistent sodium current, fast delayed rectifier Kv3 potassium current, M-type potassium current and small conductance calcium-dependent potassium current influenced the PRC shape and the steady state. The effect of those currents on the PRC shape could be attributed to extension of the firing period and reduction of the phase response immediately after an action potential. In particular, the slow potassium current arising from the M-type potassium and the SK current was responsible for the reduction of the phase response. These results suggest that the membrane property modulation controls synchronization/asynchronization in the GPe and the pathological pattern of STN–GPe activity. We thank Takeshi Takekawa for helpful comments on the numerical calculation of phase response curves.